Vintage Home & Garden: can anyone help a girl out? Oh fantastic! I too would be waving my arms frantically in the air over this one! I just was at TJ Maxx Saturday & scored some amazing bath towels! If I go and see these - I'll pick some up. It's 45 minutes away though, so I'm not sure I'll be there anytime soon. However - I'll send the link to my Mom - she's there ALL the time! Hi Mary, Marshall's is right by my favorite thrift haunt, I will run in and check for you today before I get the baby! I'll let you know. You just named my favorite stores. Seriously I was just in TJ Maxx over the weekend. Great stuff...super cheap:) I will keep a look out for you! First visit to your beautiful blog. I will be returning. Hey girl, these have a bale closure...not like the kind you are looking for exactly...but maybe close enough? I feel the EXACT same way about those stores too? Will you be my new BFF? We seem to have similar junking tastes. Today I discovered your blog and I like it very much. Will be back, good luck in your search. Love your blog. 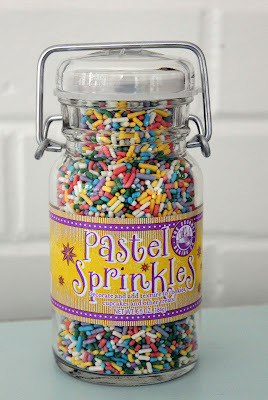 I have the same jar in my pantry (colored sugar) and saw that the company website is www.peppercreekfarms.com in Lawton, OK. I'd suggest calling them (800-526-8132 or 866-972-6879) and ask to speak to either someone in Marketing or Procurement, or Sales, etc. (someone beyond customer service or the receptionist who is likely to help) Then ask who their packaging supplier is and get a contact for them. I'm sure they'd be happy to help and it would probably be alot cheaper. Not sure, but the jar's product number might be what's on the bottom of the jar. I love Marshall's. I was just thinking of how I love them like a flea market only for my new stuff. That is hilarious! I went there tonight and I was just putting away some goodies. I have red and white Martha Stewart spice labels that I have had for about a year and I have been on the hunt for larger than normal jars and have not found them. Maybe good old Marshall's will come through. I was just at Home Goods and our TJ here isn't great. I think you know my answer to your question, my twin separated at birth. I am actually going to go and buy a whole stack of new towels for my bathroom- all matching- yup. Unbelievable etravagance. I mean, how can I get it to look like a magazine if my old burgundy , grren and blue towels from the 90's mix with my tan and blue and chocolate from 3 years ago? I need all cream towels STAT. Need any paint rags? Hi there, stumbled across your awesome blog and found a spice jar that looks very vintage to me. The round one. 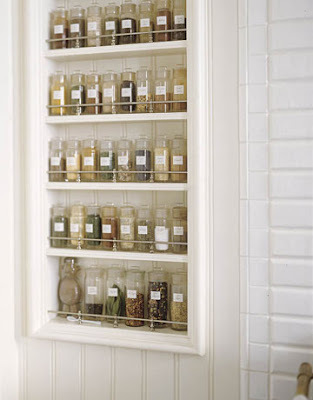 btw...how did you make that spice rack? I LOVE it soo much! 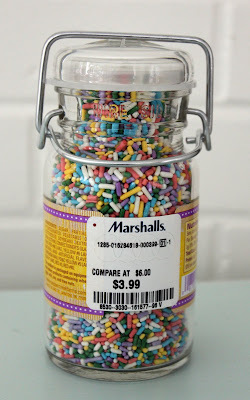 I just returned from the Home Goods and TJMaxx near me (Morton Grove, IL) and there were 21 jars at the Home Goods and another 15 or so at the TJ Maxx a few doors down. Let me know if you need me to pick some up for you. Sounds like you got some answers, they were all out at Marshalls by me I checked yesterday... :( hopefully Jeanne has the hook for you! Just stumbled on your blog-you are in luck I have a Marshalls, TJ MAxx and Home Goods within a five minute drive of my home - I will take a look today-they are my weekly obsessions! I know some online places sell commerical/wholesale packaging, and lots of food jars too. Those bottles are darling...have you looked at Michael's...they have cute little bottles that look a lot like that....and they're only $1.00 each. I'll keep my eyes open for bottles! Mary, I love your blog! Hope you got the info about the container-store i sent you! (containerstore.com) Looks like you got a lot of great ideas. Cute post! I was wondering where you found the Martha Stewart spice jar idea? I will be on the look out for spice jars like you need:)! PS: If you happen to find that link and dont mind sending it to me, my email is ashley_noelle01@yahoo.com. Thank you! a remarkable post and a all round entertaining blog (I also love the theme/design), I don't have time to browse it all at the moment but I have bookmarked it and also included your RSS feeds, so when I have time I will be back to read a lot more, Please do keep up the superb work. Awesome! Its truly awesome piece of writing, I have got much clear idea concerning from this post. need a specialist in this area to solve my problem.